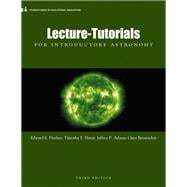 Lecture-Tutorials for Introductory Astronomyprovides a collection of 44 collaborative learning, inquiry-based activities to be used with introductory astronomy courses. Based on education research, these activities are "classroom ready" and lead to deeper, more complete understanding through a series of structured questions that prompt you to use reasoning and identify and correct their misconceptions. All content has been extensively field tested and six new tutorials have been added that respond to reviewer demand, numerous interviews, and nationally conducted workshops. Edward Prather is the Executive Director of the Center for Astronomy Education (CAE) and Associate Professor of Astronomy in Steward Observatory at the University of Arizona. Over the past fifteen years, Ed has been dedicated to improving Earth, Astronomy, and Space Science education through research, curriculum and assessment materials development, and instructor professional development on teaching and learning. He is also the recipient of the 2007 University of Arizona’s Provost Education Prize, the 2009 University of Arizona’s College of Sciences Innovations in Teaching award, and the 2011 American Association of Physics Teacher’s Halliday and Resnick Award for Excellence in Undergraduate Physics Teaching. Tim Slater is the University of Wyoming Excellence in Higher Education Endowed Chair of Science Education. He holds appointments as Professor in both the Department of Physics & Astronomy and the College of Education. An award-winning professor with more than 100 publications, he has spent the last six years as the Education Officer of the American Astronomical Society and served on the Board of Directors for the National Science Teachers Association, the Astronomical Society of the Pacific, and the Society of College Science Teachers. Jeff Adams earned his Ph.D. in theoretical physics from Queen's University, in Kingston Ontario, Canada. After also becoming a certified high school mathematics and physics teacher, he joined the faculty at Montana State University, Bozeman, where he taught physics and astronomy, mentored graduate students, conducted research on student learning, and developed curricular materials for use in introductory physics and astronomy. In spring 2002, he received the College of Letters and Science award for outstanding teaching. Jeff is currently the Associate Provost for Academic Administration at Millersville University. Gina Brissenden is the Associate Director of the Center for Astronomy Education (CAE) and a Science Education Research Specialist in Steward Observatory at the University of Arizona. She is also the former Education Specialist for the American Astronomical Society. Gina’s work focuses on improving Earth, Astronomy, and Space Science education through research, curriculum and assessment materials development, and instructor professional development on teaching and learning.